WASHINGTON, Aug. 22, 2014 - The Defense Department has expressed its concern to Chinese diplomatic officials about an Aug. 19 incident in which an armed Chinese fighter jet conducted a dangerous intercept of a U.S. Navy P-8 Poseidon patrol aircraft, Pentagon Press Secretary Navy Rear Adm. John Kirby told reporters today. The aircraft was on a routine mission when the intercept took place over the Pacific Ocean about 135 miles east of Hainan Island in international airspace, Kirby said. "We have registered our strong concerns to the Chinese about the unsafe and unprofessional intercept, which posed a risk to the safety and the well-being of the aircrew, and was inconsistent with customary international law," he said. Kirby also noted that DoD officials believe the Chinese jet made several passes and crossed under the aircraft with one pass having only 50-100 feet of separation. "The Chinese jet ... passed the nose of the P-8 at 90 degrees with its belly toward the P-8 Poseidon, we believe to make a point of showing its weapons load out," Kirby said. "They flew directly under and alongside the P-8, bringing their wingtips ... to within 20 feet and then conducted a roll over the P-8, passing within 45 feet." The admiral asserted that the incident undermines efforts to continue developing military-to-military relations with the Chinese military. "This kind of behavior, not only is unprofessional, it's unsafe," Kirby said, "and it is certainly not keeping with the kind of military-to-military ... relations that we'd like to have with China." On April 1, 2001, a Chinese fighter jet collided with a U.S. Navy EP-3 surveillance aircraft -- the P-8 Poseidon's predecessor aircraft -- that was flying a routine mission in international airspace over the South China Sea. Wang Wei, the Chinese pilot whose fighter jet collided with the EP-3, was killed. The damaged EP-3 made an emergency landing on China's Hainan Island, where its crew was held by Chinese authorities and eventually released. 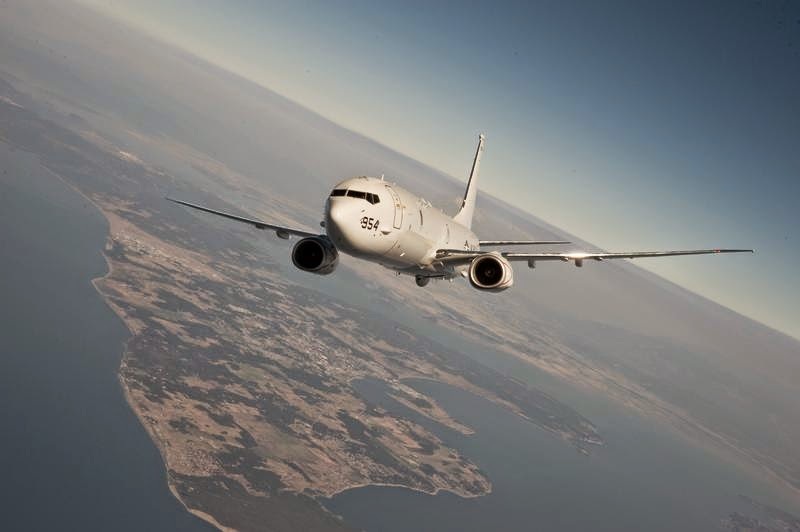 Note: The above U.S. Navy shows a P-8 Poseidon in flight.